So I already have my Russian book for my Read The World Challenge, but I think this might give it a run for its money. We shall see if I decide to add it to the permanent shelf - I might have to. 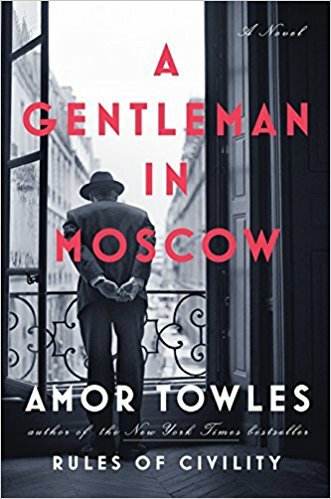 This book is about Count Alexander Rostov who in 1922 is sentenced to house arrest at the Metropol in Moscow where he resides. An aristocrat that has never worked a day in his life must now live in the attic of the hotel, in a tiny room, and leave most of his possessions behind. The outside world of Russia continues on without him as he is never permitted to step outside. But his life is rich and full as a cast of characters come in and out of his life as he lives out his days behind the walls of the hotel. He forms several lasting relationships with staff at the hotel (especially the chef for Alexander has an intense interest in good food) and two little girls who he comes to care deeply for as a father figure. There are times where the Count feels low and wishes he could end it all but someone or something always pulls him back from the brink. He becomes the most alive when he takes on a job as a waiter in the hotel's restaurant and is invited to taste test the food before it is served each evening. This was a fantastic book. It is beautifully written, and is making my list of best books I have read this year. I enjoyed every sentence. The book time hopes over many years - covers the Counts life as he lives out his days (and his sentence) in the hotel. He meets several people at his time there that change his life forever, and stay interwoven in his life and this story throughout the book. It is a beautiful story and you shouldn't miss it. Put this book on your must read list for 2019.